Harper Gage has won the opportunity of a lifetime – ten days at Winmaroo Jillaroo and Jackaroo school. The camp could give her the recommendation she needs to go to the exclusive Agricoll for years 11 and 12. But when an accident leaves Harper hospitalised, her twin sister, Heidi, goes in her place. The only problem is that Heidi is not much of a country girl – not like her sister. And to make life even more complicated, her sister’s biggest rival Trent is going to be there. Will she be able to fool him? And then the reality of the school hits Heidi hard. It’s all dust, snakes and heat – a million miles away from the surf she loves. When she meets the fun and handsome Chaz, life at the school suddenly doesn’t seem so bad, although with Trent acting up and trouble brewing with the other students, Heidi’s not sure how long she can keep her identity secret. And if her secret is revealed, will Chaz ever be able to trust her again? 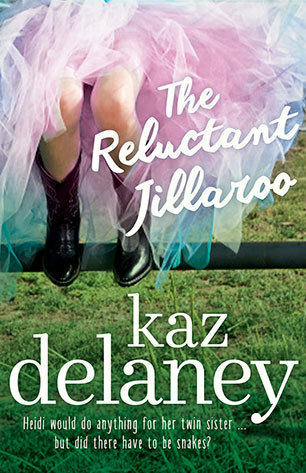 Once again Kaz Delaney had me awake until 3am finishing one of her books. Read, finished, and loved the same day I got it and it was wonderful from start to finish! Kaz gets your attention early on by starting in the middle of a moment, we are thrown into the story with no idea what has happened, and only Heidi’s thoughts to fill us in. I love stories that drop you straight in the action; it makes your curious and engaged right away. The idea that Heidi and Harper have concocted is well within the realm of believability, and Kaz writes so well that the story flows seamlessly and you get caught up in the story naturally. Of course Heidi’s experience isn’t going to go smoothly, having to act like her sister and hiding her inexperience is drama enough without also dealing with a budding romance and the unexpected arrival of someone who actually knows her sister. Watching Heidi deal with everything that comes her way is fun and commendable. She never gives in and covers her tracks as best she can, not without the pang of guilt and the sadness she feels at lying to people she’s become good friends with. Heidi is a great and admirable character. She’s a Batman lover (a great start), but she is also friendly and welcoming, even when she is out of her depth, and her loyalty and determination outweigh her fears and trepidations. She’s uncertain in her surroundings but she is strong and determined, not willing to let her sister down. Her commitment to her sister drives her to succeed and sees her doing things she wouldn’t normally do. What I also adored about her is that she has a great moral sense and good nature that makes her want to help people and make them feel included. Looking after other camp attendees and noticing what others are doing or feeling, making sure they are happy, is what makes her a wonderful person. But this is not just a simple story where Heidi mustn’t be found out, there are mysterious things happening at the camp as well. The gradual introduction of the mystery is subtle and at the same time doesn’t deter from Heidi’s fish out of water experiences. Kaz connects everything brilliantly and there are twists and turns offering up a different thrill away from watching Heidi try to drench sheep or milk cows. The best part about reading this though is how it feels like you are right alongside these characters, riding along trails, whispering at night in bunks, and having everyday experiences. That’s what makes Kaz’s writing so wonderful, it feels so realistic. Everything happens all at once, everything overlaps, and there can be fun and drama and love alongside one another. It’s clear Kaz has done some amazing research and gone to a lot of effort to make this story feel authentic, not just in the camp activities, but also in making sure every character feels like a complete person, full, developed, and with experiences of their own behind them. You can’t help but love them all for their quirks and their different personalities; the comradery and friendships are evident, even after such a short time. There really is so much to love about this story, it’s fun, suspenseful, and filled with mystery and madness that keeps you hooked from the start, not to mention an ending that will amaze! I love the cover of this book! Great review – very helpful.